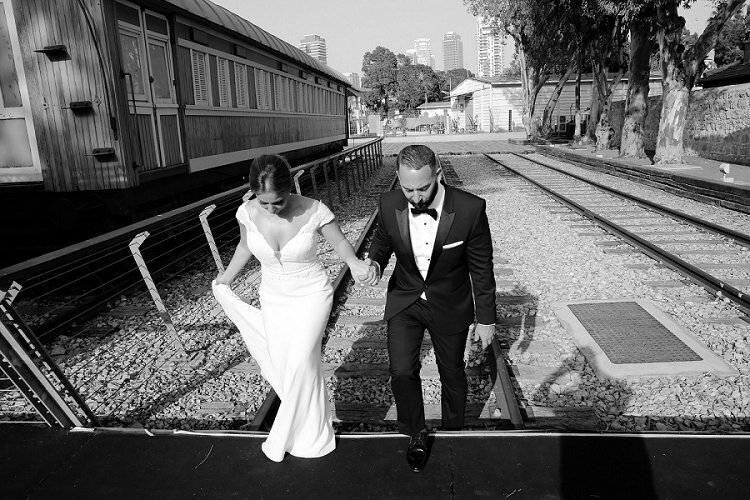 Oh my goodness, there is SO much to gush about today’s gorgeous Jewish Tel Aviv wedding. 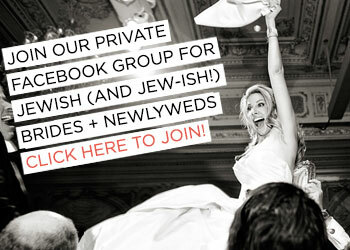 First of all WHAT A CHUPPAH! 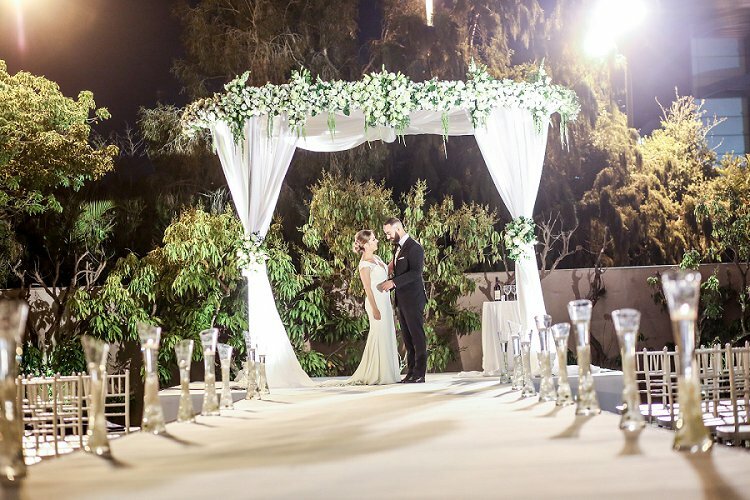 What a setting for a spring-themed wedding, under a beautiful white chuppah, adorned with greenery and roses. So romantic. 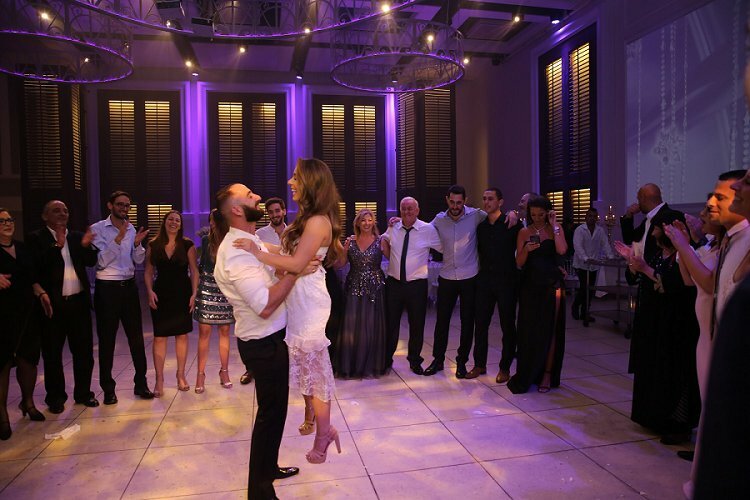 Gabrielle and Tomer met in LA and decided that a wedding in the Holy Land was the only way to go. Planning the whole thing from overseas must have had its challenges, but just look at those stunning results! 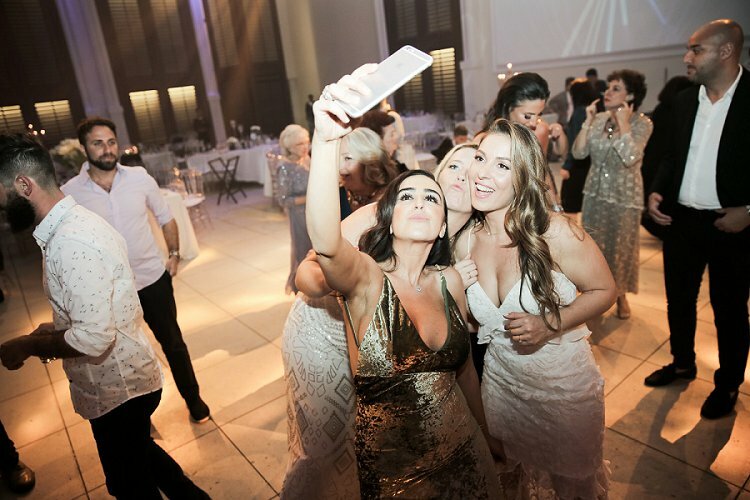 The wedding hashtag #TheJooons, was just one way the happy couple paid homage to Gabrielle’s Persian/American heritage. We won’t spoil that story, or the rest, for you, you’ll have to read on, but we’re already in love with these brilliant traditions. 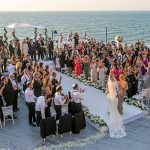 Photographer Eyal Zalzberg didn’t just capture the mood and story of the day, but also created some SERIOUSLY incredible images around Tel Aviv’s trendy neighorhoods, and we’re simply head over heels for the romantic and dreamy wedding highlights film by videographer Nati Shoko. We’ll pass you on to Gabrielle for all of the planning details – we’d say “get Pinning”, but we’re pretty sure you won’t be able to stop yourselves anyway! 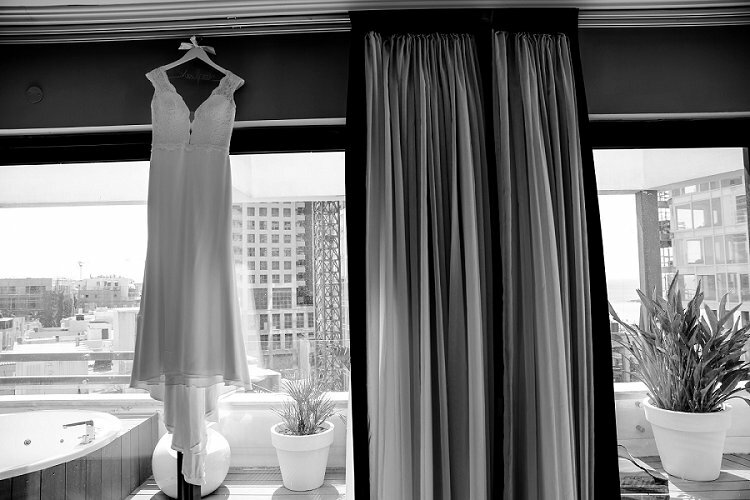 Gabrielle, the bride: We first met online in Los Angeles (the good, old-fashioned, new way). We talked for a couple months off and on through texting and email before we even decided to meet in person. Our first date was at a bar in Santa Monica, and the rest is history. 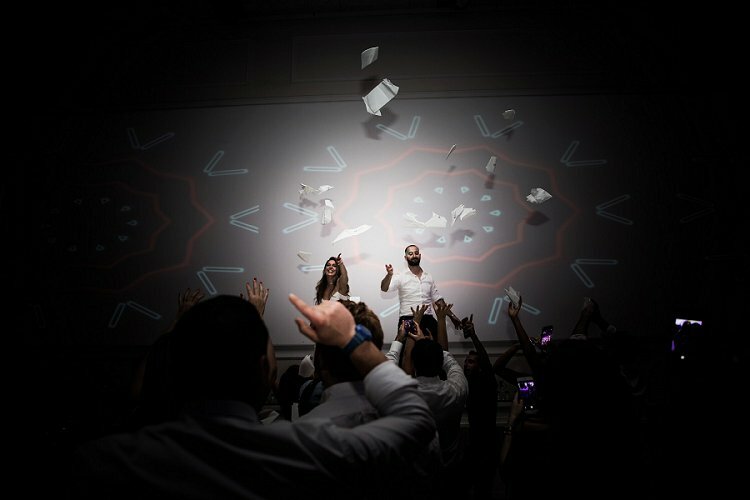 We got married in Tel Aviv, Israel at Avenue. 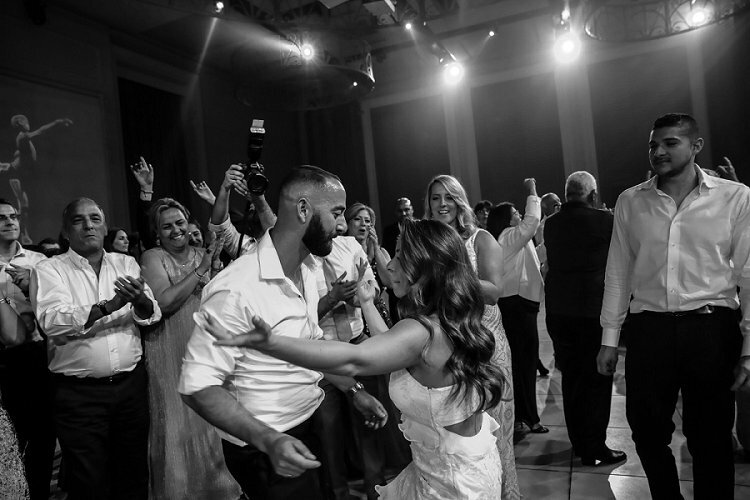 We knew from the beginning of our relationship that if we did take the next step in getting married we wanted to do it in the holy land and where Tomer’s family is from. 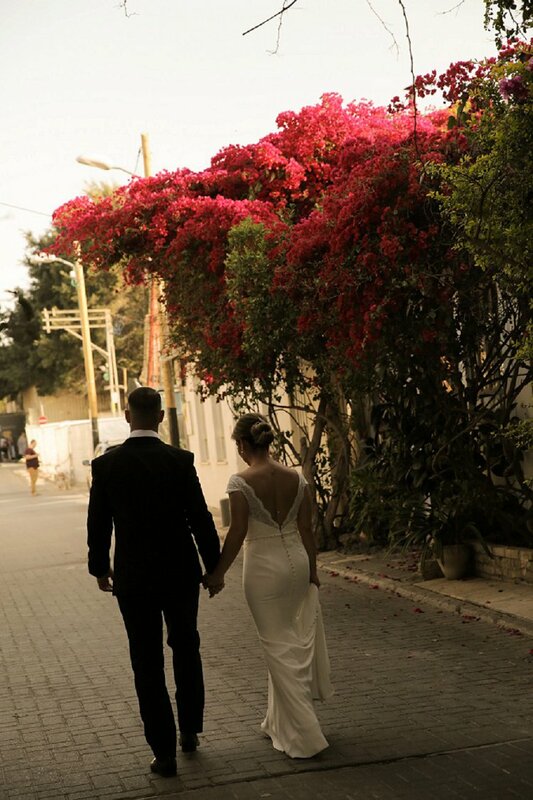 It was really special having our wedding in Israel with all of our closest friends and family. We had a week long of activities and celebrations with Tomer’s family and our friends/family who traveled from abroad. 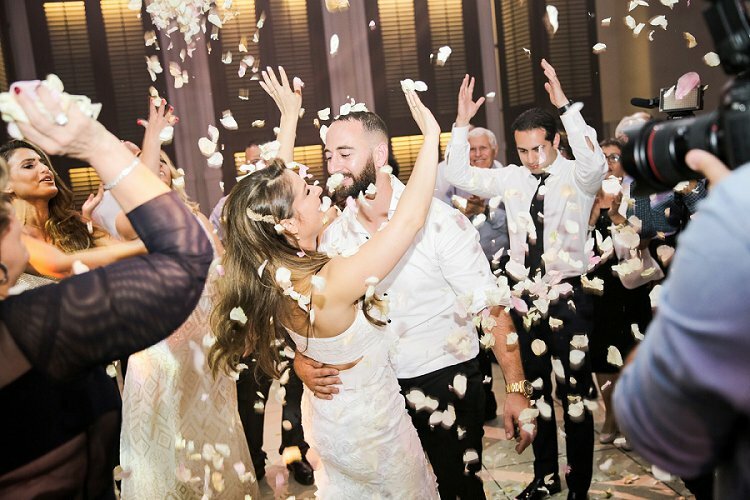 With the help of Tomer’s parents, we planned the wedding of our dreams through emails, photos, and lots of long-distance phone calls! 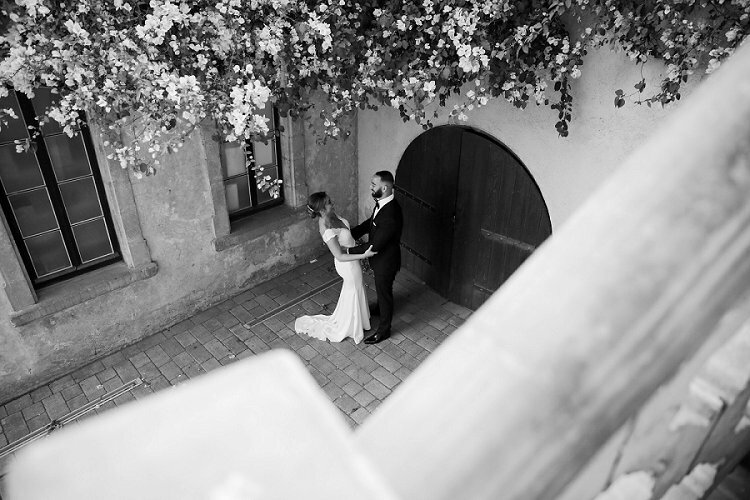 We decided on Avenue because it checked off all our wish-list items – pretty outdoor area for the cocktail hour and ceremony, a great indoor space for the party, really great in-house team for planning and decorations and amazing in-house catering for some of the best wedding food we’ve ever had! 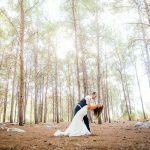 Having everything done in house made things much easier and streamlined, especially when planning from abroad and they were flexible with us and met with us the week before the wedding when we arrived to finalize everything. 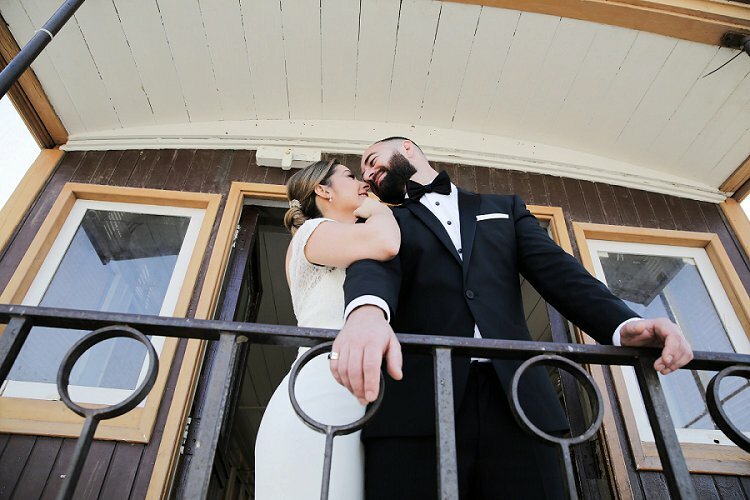 I wouldn’t say we had a theme, but since we decided on an early spring wedding, we wanted the colors to be light and fresh and to symbolize the start of something new. 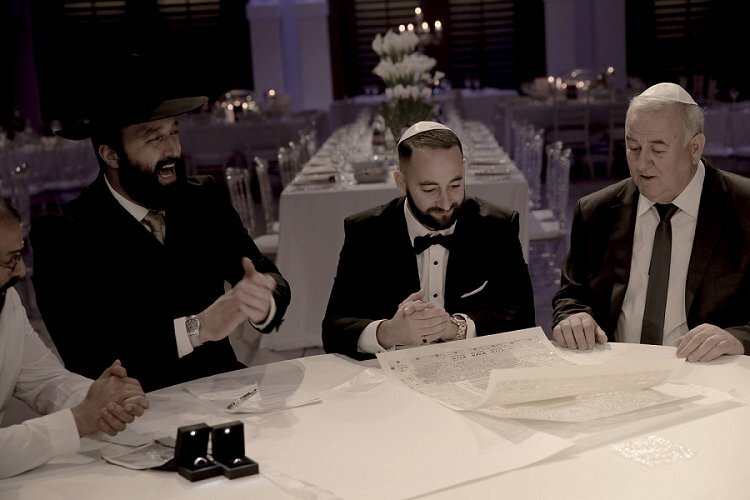 We went with all white with some greens throughout in the chuppah, and as well with with the table dà©cor. I scoured the Internet, Pinterest and Smashing The Glass to help with inspiration and ideas! 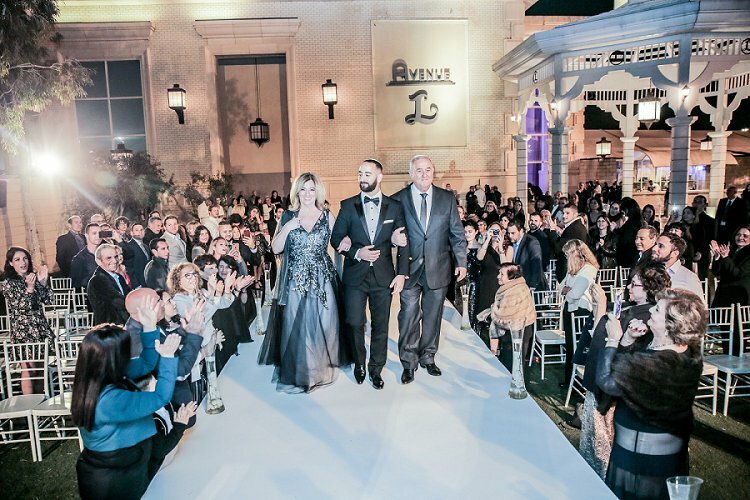 We also worked with a wedding planner from Avenue who helped coordinate and execute on everything. 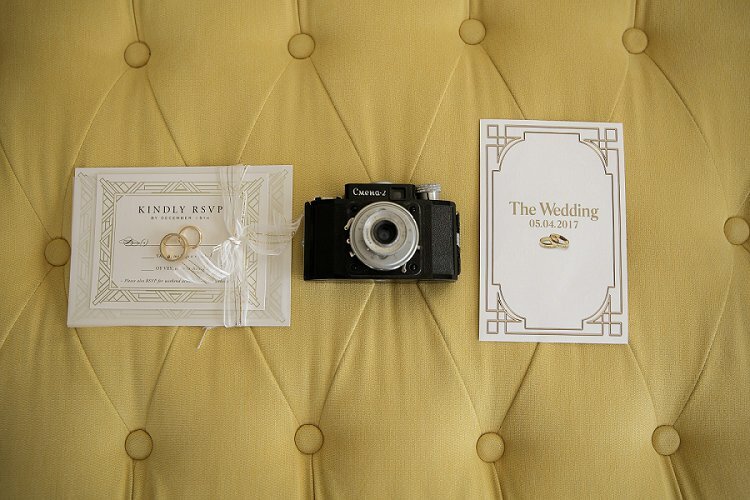 I wanted the invitations to have an Art-Deco style. We had two versions of the cards (one in Hebrew and one in English); the English was for our guests traveling from abroad, and I found a really great card option that I got to customize on Minted. The second version was in Hebrew for all our local/Israeli guests, which was made by a local/Israeli card designer who was able to complement the design I made on Minted. I also added these cute RSVP lines to make it fun and to go with the destination wedding – Yala, my bags are packed / Oy Vey, sorry to miss out. 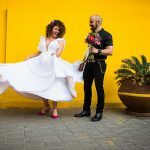 We used a great and very user-friendly wedding website called Appy Couple to consolidate all our wedding details for people traveling abroad. 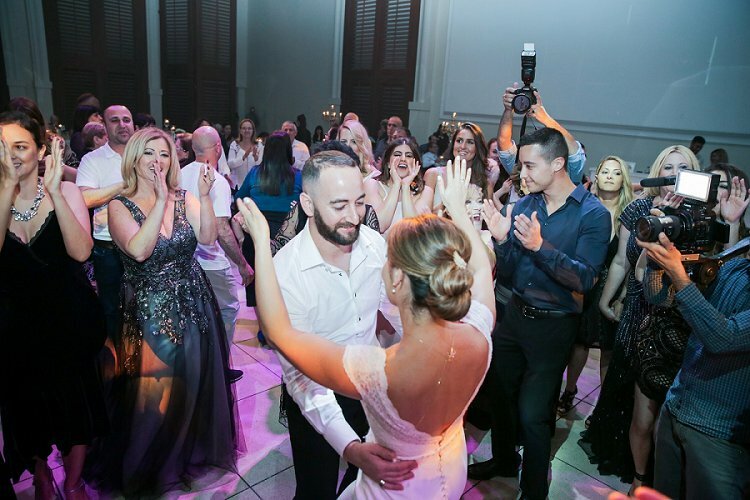 We provided things like hotel and restaurant recommendations, all activities for the week leading up to the wedding, to fun facts about Tel Aviv and things to do. We stayed at the Brown Beach House Hotel, where we got ready separately. It’s a cute boutique hotel near the beach that had a fun modern style which made for great pictures. The rooms were huge, which helped fit everyone getting ready. The morning of the wedding I had my bridesmaids join me in my hotel room at the Brown Beach House Hotel, where we ordered room service, listened to music and hung out before we all started to get ready together in my room. 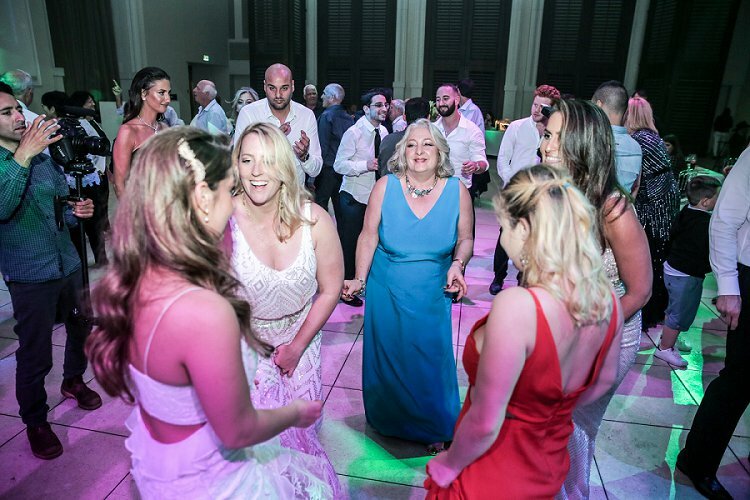 Even though it started to get crazy with so many people in the room (will all the girls and hair/makeup people), it was great having everyone with me because it made the time fly by and everyone seemed relaxed which kept me relaxed. I had the best hair and makeup team. My sister-in-law, who lives in Israel, highly recommended them, and they didn’t disappoint. For my hair, I used Eran Ohayon. 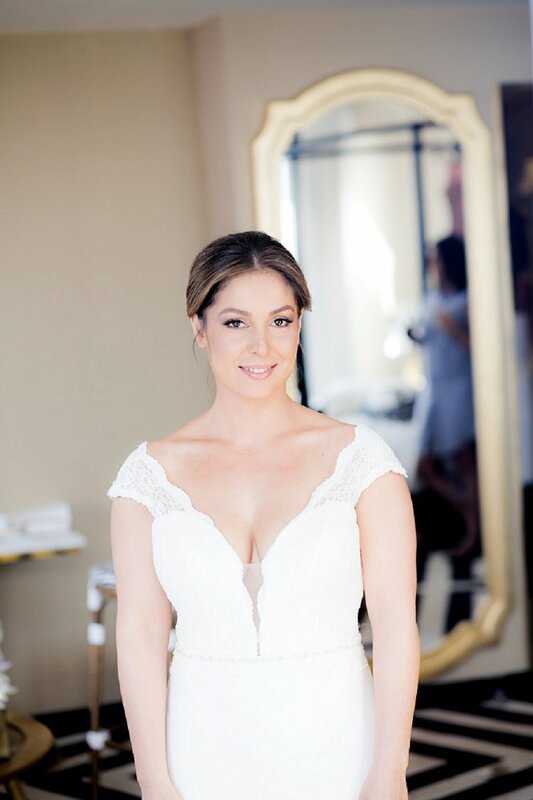 We decided on doing two looks – first, for pictures and the ceremony, I wanted it all up to show my back and back necklace, and then for the party with my second dress I had my hair all down off to the side with beautiful glam waves. For makeup, I used Yaara Mordehay. We went with an all natural look but with subtle smokey eyes. 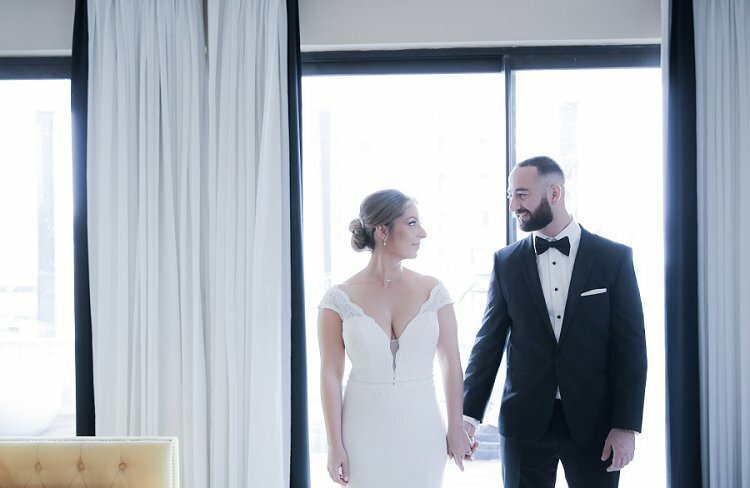 My dress is by Canadian designer, Mikaella Bridal, and I got it from a local bridal shop in Los Angeles. I tried it on three different times before I finally said yes to it. 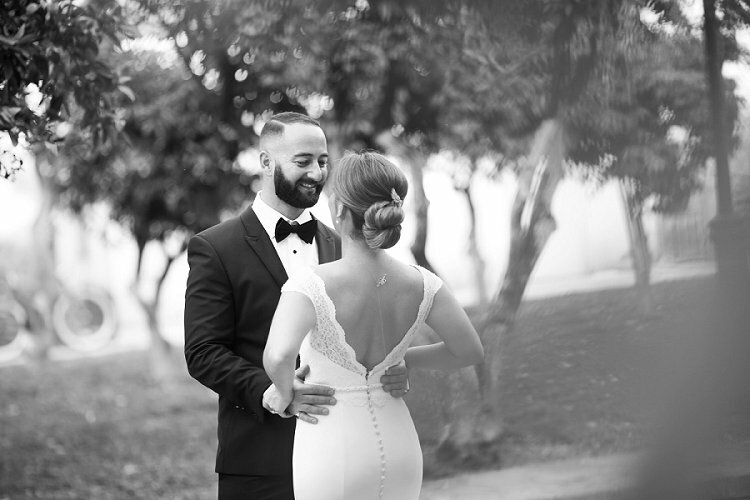 It was “the one” because it had all the things I was looking for – simple, classy, with an open front and back, and a touch of lace. I didn’t want a lot going on with my dress. I also modified one thing on the dress to make it my own – I added buttons down the back of the dress. I thought it came out looking beautiful. 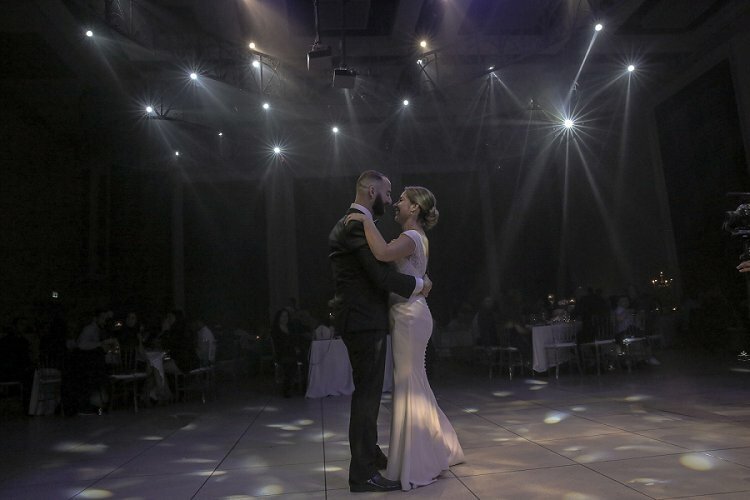 I loved my wedding dress, but I knew I couldn’t dance in it all night so I got a second dress which I changed into a little after our first dance. It was super cute and comfy to dance in. I got really lucky and found it three weeks before we were leaving for Israel! I wanted my jewelry to be simple and classy, so I went with pearls. I had a beautiful choker with a back-drop necklace handmade by a talented friend of mine. There are a few pearls in the front with a gold branch at the nape of the neck, and another pearl at the drop of the necklace. 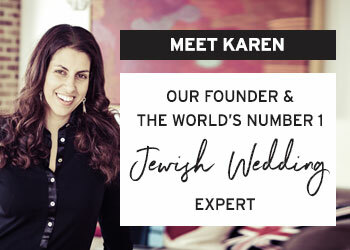 I also wore simple pearl-drop earrings and had a hair piece made for me by an Israeli hair accessories designer (Efrat Cassouto) when I was already in Israel a couple days before the wedding. I wasn’t planning on putting anything in my hair, but my hair stylist recommended it, and I’m glad I went with it. The hairpiece also had pearls and tied in really nicely with my jewelry. I also had a pretty chantilly lace veil made by someone I found on Etsy. I had two pairs of shoes, because I was highly advise to not wear my main shoes all day/night. My main pair for pictures and for the ceremony, were these super cute nudes with beautiful bows at the front by Salvatore Ferragamo. They were so different and pretty when I saw them that I knew they’d be perfect. During the rest of the party, I wore these chunky platform heels that were really comfortable so I could dance all night. I highly recommend any bride do the same to save their feet! 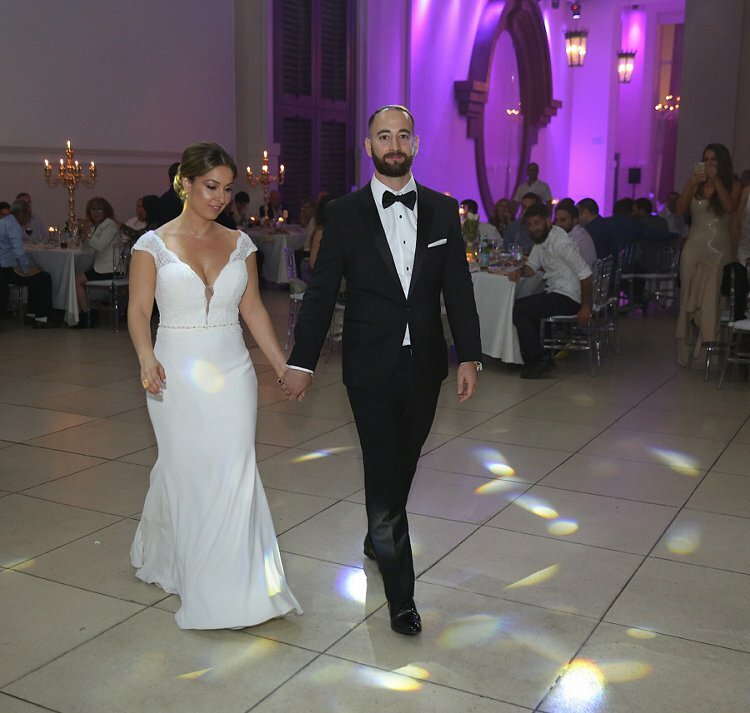 Tomer wore a classic Hugo Boss tuxedo with a black bow tie. He went pretty traditional with his look, but a few key pieces that stood out were his socks and jewelry. He wore red striped socks that showed just a touch to add a pop of color and style. 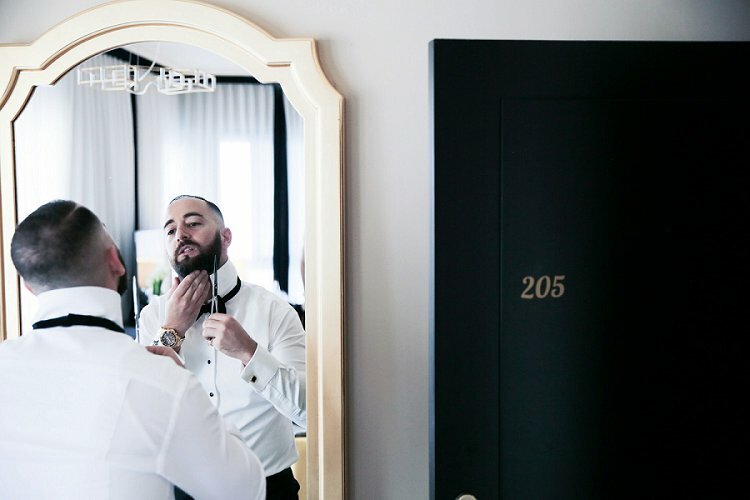 He also likes a little flash, and wore his favorite custom pinky ring with black onyx and a gold watch that was given to him as a wedding gift. I had four lovely bridesmaids. I didn’t require they wear matching dresses, but only requested that they wear a light color (like blush or gold) to go with the light colors of the wedding. I wanted them to be able to find a dress that they felt comfortable and beautiful in. 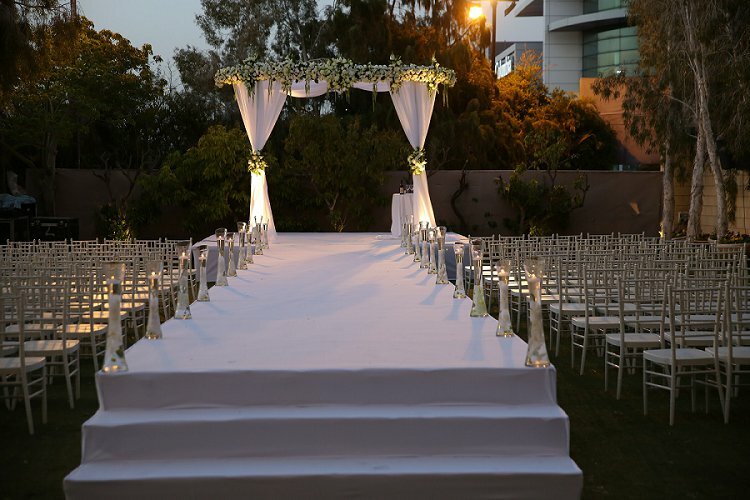 Going with the rest of our style, we wanted a classy, light and airy chuppah, because it was spring time. 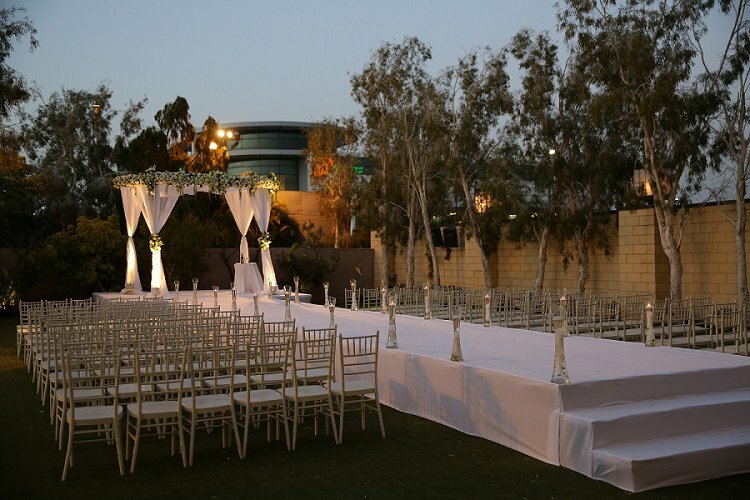 It was an open, round chuppah with white flower drapes and with white and green hanging flowers. It was beautiful and exactly what I had envisioned. For our ceremony, we had all of our closest friends and family walk and stand under the chuppah with us, which was special. 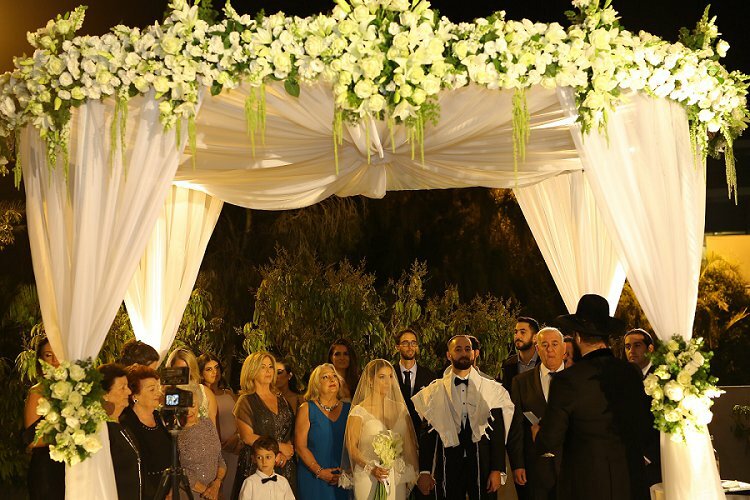 The chuppah was large enough to fit everyone! We also played a different song for each group of people walking, to make it fun. For instance, we played Jonas Blue (Fast Car remix) for friends and Ellie Goulding (Love Me Like You Do violin cover) for our three grandmothers. 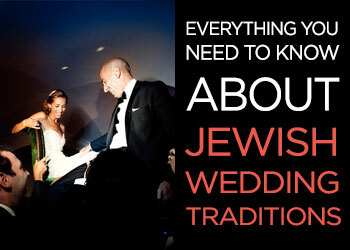 Other than that, our ceremony was a pretty traditional orthodox-style ceremony, as is the custom in Israel. 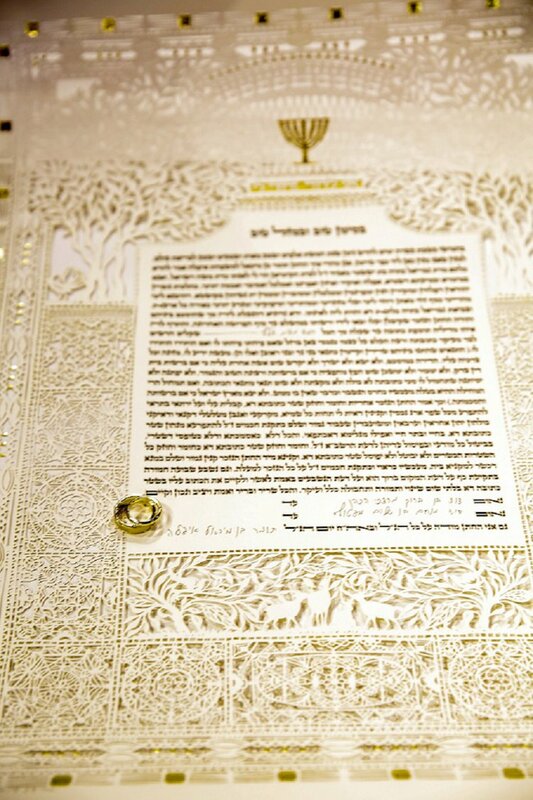 We had a beautiful ketubah made by Danny Azoulay, a Jerusalem-based artist. It’s a white and gold paper cut out. 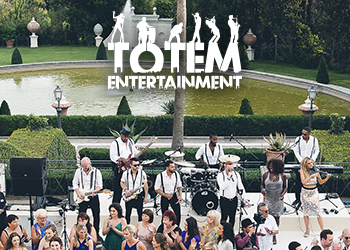 We wanted a really great mix of music from top 40, dance/electronic, Spanish, Israeli and even some Persian music! 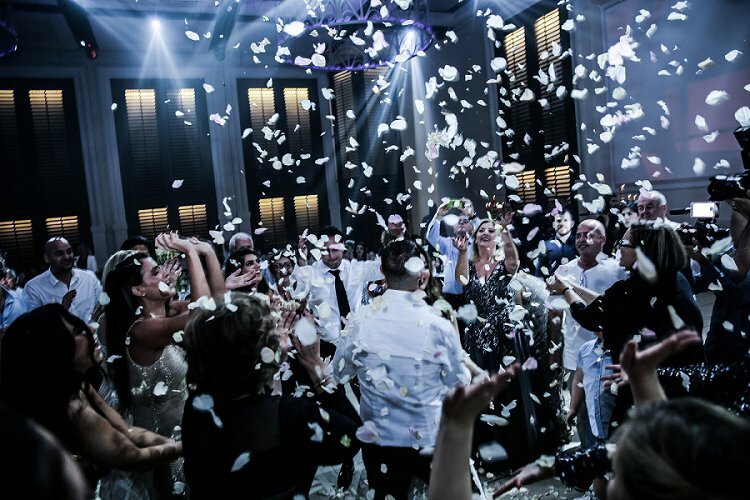 Anything that would keep the crowd on the dance floor all night! 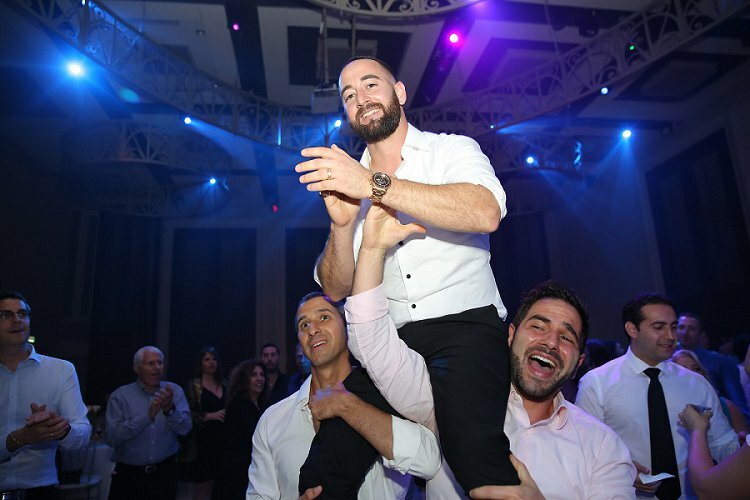 Tomer found the DJ – DJ Eran Sayag. From the beginning he was really receptive and easy to work with on music and song suggestions, and understood how we wanted the night to go. We gave him a list of songs we liked, but also gave him the freedom to play whatever he thought would be best as the night progressed to go with the crowd. 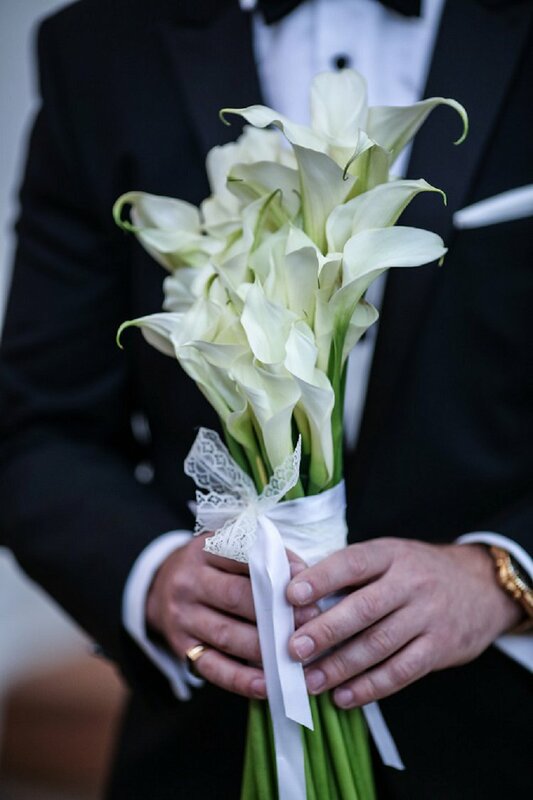 I had a simple and pretty bouquet of Calla lilies and the bridesmaids had these really cute small ranunculus bouquets. 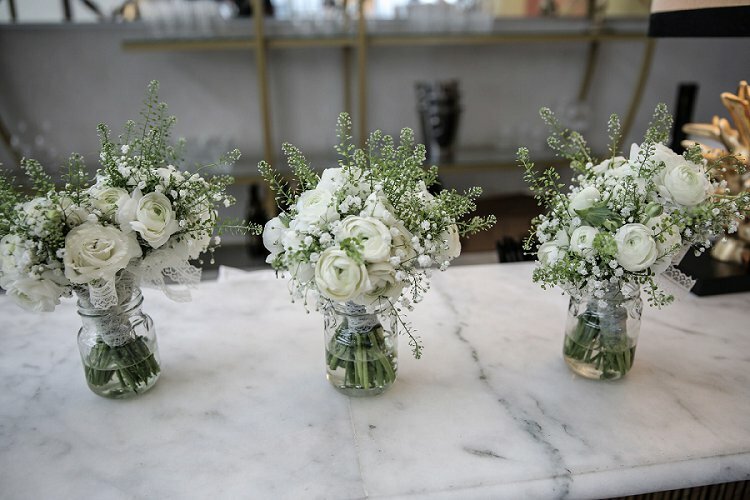 The bouquets were provided by Oran Nave Flowers Design. 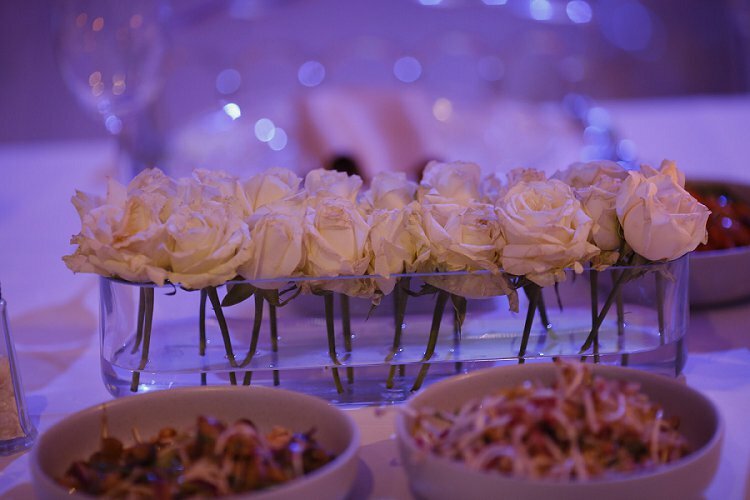 The chuppah was all white roses with green hanging amaranthus. For the table dà©cor we had a mix of white and green clusters and heights of roses, Calla lilies, snapdragons, tulips and lots of different candles. 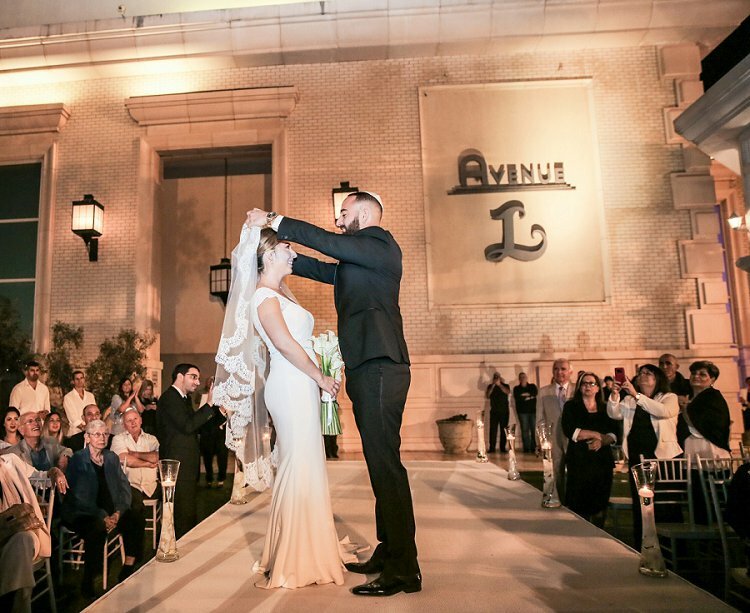 The chuppah and table decorations were created in house by Avenue. We went with Eyal Zalzberg as our photographer, because his style was what were were looking for – urban/modern with natural, photojournalistic shots (less posed), but also because he had a really easy-going and confident attitude. He planned out the times for the wedding day so we’d be on schedule, and coordinated where exactly we’d go for our pictures. We chose the Neve Tzedek neighborhood of Tel Aviv for its old charm and buildings. Catering was provided in house at Avenue. Since we didn’t get to do a food tasting in advance, they accommodated us to do it just a week before the wedding. I was blown away by the quality, taste and style of how the food was presented. 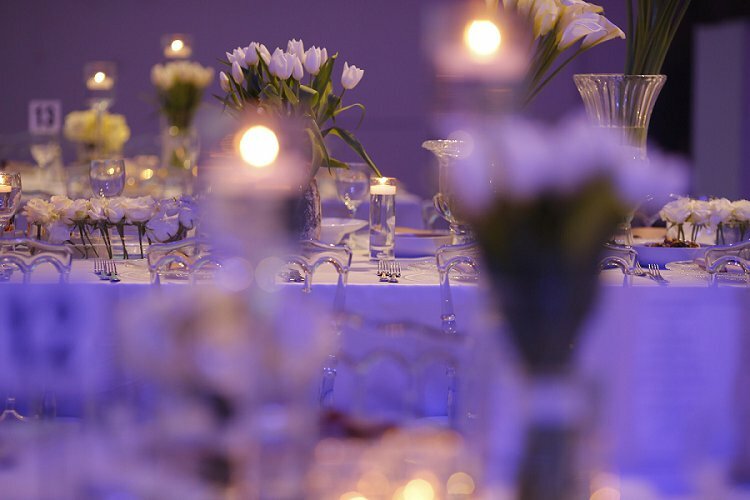 Everything was delicious, and it was one of the main reasons why we selected Avenue. 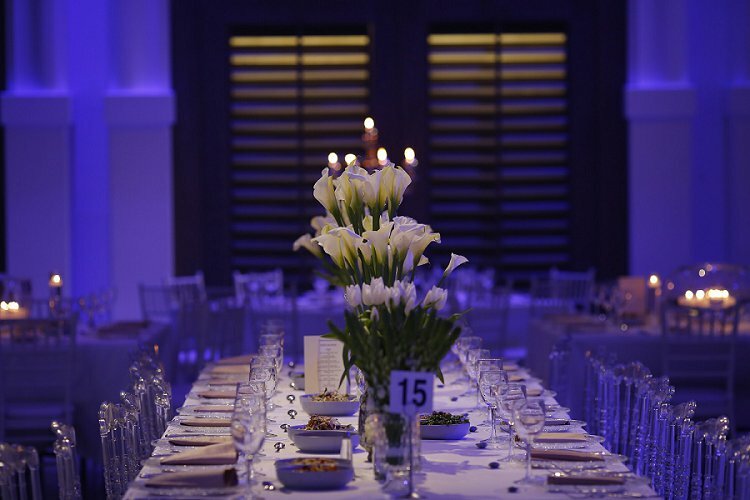 All of our wedding guests raved about the food, during and after the wedding. Wedding cakes aren’t a big thing in Israel, and I didn’t really care either way, so we just decided that it was one less thing to worry about and went with these amazing dessert platters that were served at the end of the night. 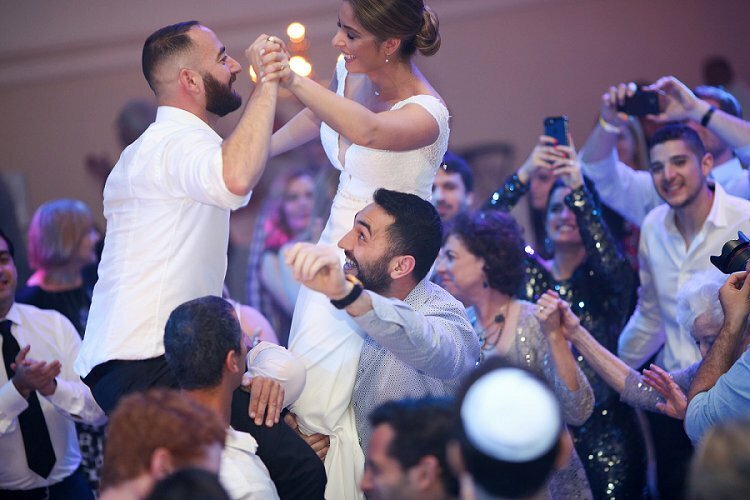 We had a really awesome DJ who played a wide selection of music throughout the night – DJ Eran Sayag. Our first dance was to Michael Bublà© (Close Your Eyes). 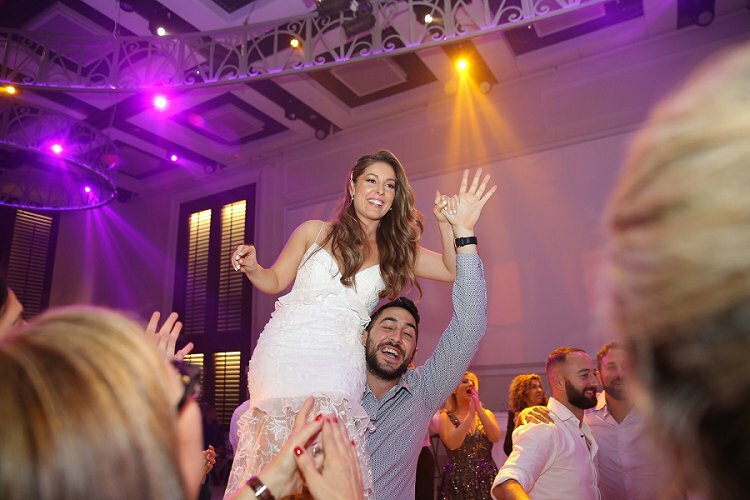 Tomer was adamant he pick our first dance song which, was his song dedication to me. It was really sweet. At the very end of the night, for our very very last song, all the last men and women standing surrounded us on the dance floor as we danced again to our first dance song. 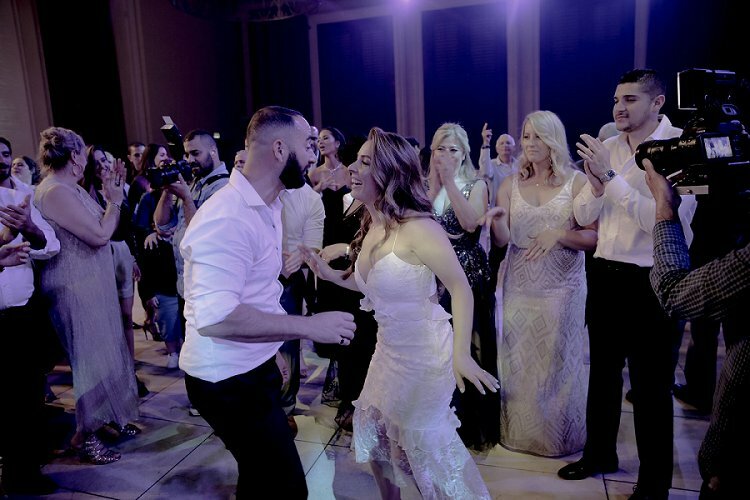 This was one of my favorite parts of the night – ending a magical day and night surrounded by our closest family and friends. 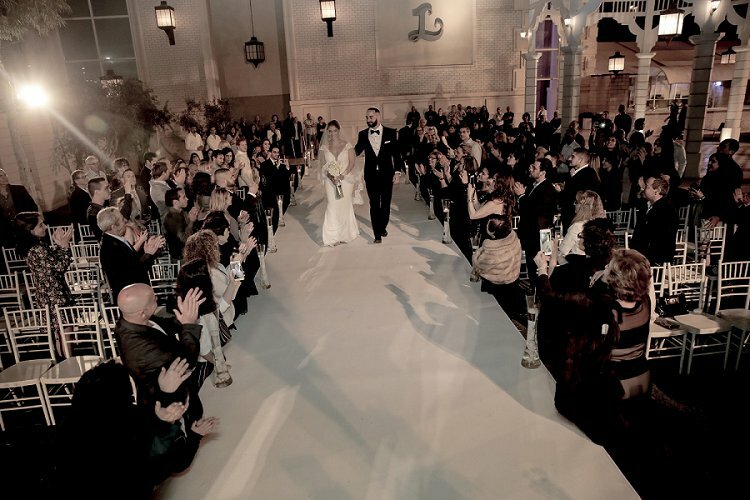 Another special thing we wanted to incorporate was my Persian/American traditions into the wedding. 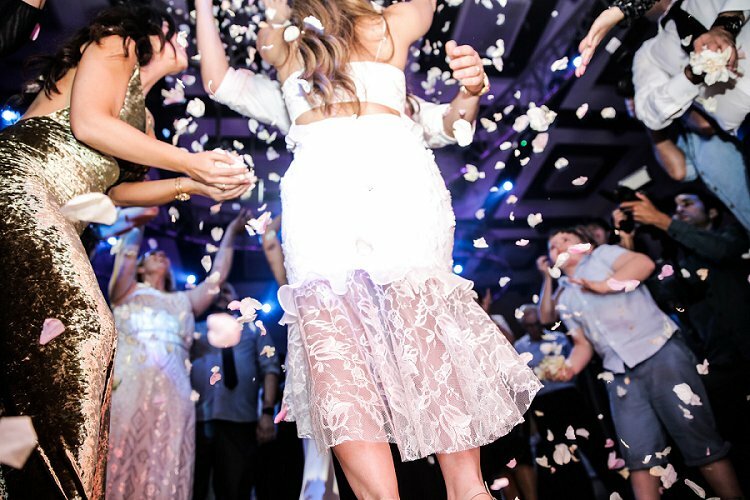 We played a traditional Persian song at one point in the night where everyone surrounded us on the dance floor and then baskets of flowers were passed around so everyone could throw flowers onto us during the song. The chorus of the song literally tells everyone in Farsi to throw flowers onto the couple. It was a lot of fun. At the end of the night, Tomer and I got up on the bar counter and started dancing for the crowd and threw napkins onto everyone like it was raining napkins. 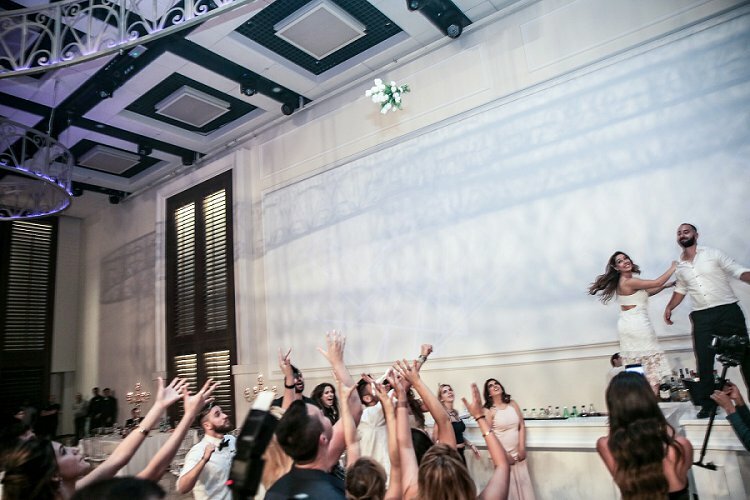 We also did the traditional bouquet toss, which everyone got a kick out of. We created a hashtag that perfectly fit us. When we first started dating, I taught Tomer a Persian word (Joon) which means “sweetie”. So we started calling each other Joon as a joke. Then everyone around us would make fun when they’d hear us using that word, and would start calling us “Joooon”. 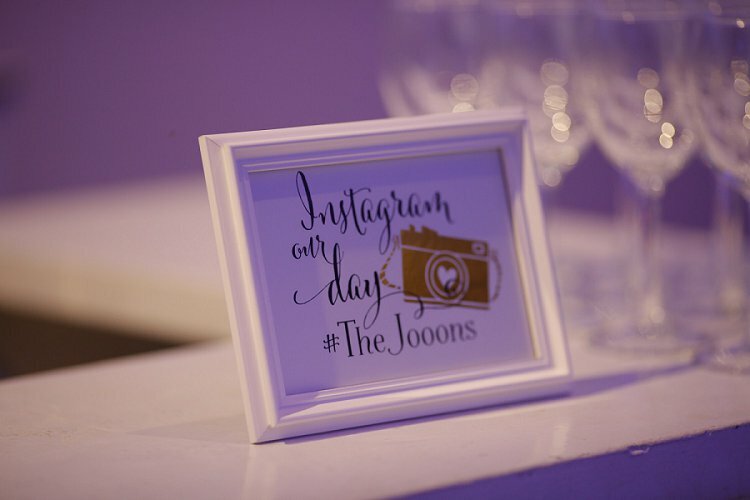 So, the word stuck and our hashtag is #TheJooons. Go with your gut. 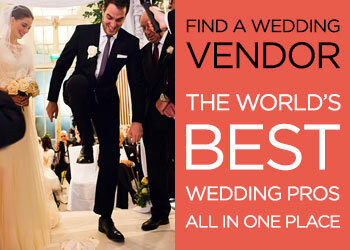 If you feel you need to ask a vendor a question or give a suggestion before the wedding, do it, or else you won’t get what you envisioned. Ask a million questions if you need to and don’t be shy about it. Realize in advance that everything may not go exactly how you want it to, and to just go with the flow with whatever may come up that day. Just take a deep breath. One thing Tomer kept reminding me, and made some sense then (though it was hard), but especially after it was all over, was that the most important thing is that we build a solid and happy life together as a couple and that the wedding is only a very small part of our happiness and to not focus on every minor detail because it will be over after that one night and we have the rest of our lives to have many other special memories.